The annual pumpkin binge is upon us. It’s upon me. It’s. All. Up. On. ME. During my usual autumn pumpkin binge, most of the things I eat are sweet. Pumpkin muffins, lattes, cakes, pie, ice cream. You name it, I eat it. But this year, one of the best pumpkin foods I’ve had wasn’t a sweet at all. It was a pizza! Yes, a pumpkin pizza! Talk about awesome worlds colliding! I was at Forcella, the super-freakin’-delicious Neapolitan pizzeria on the Bowery between NoHo and the East Village, having dinner with a friend, when she pointed it out on the menu. (I was probably staring at the word burrata and having cheese fantasies and hadn’t already noticed it.) 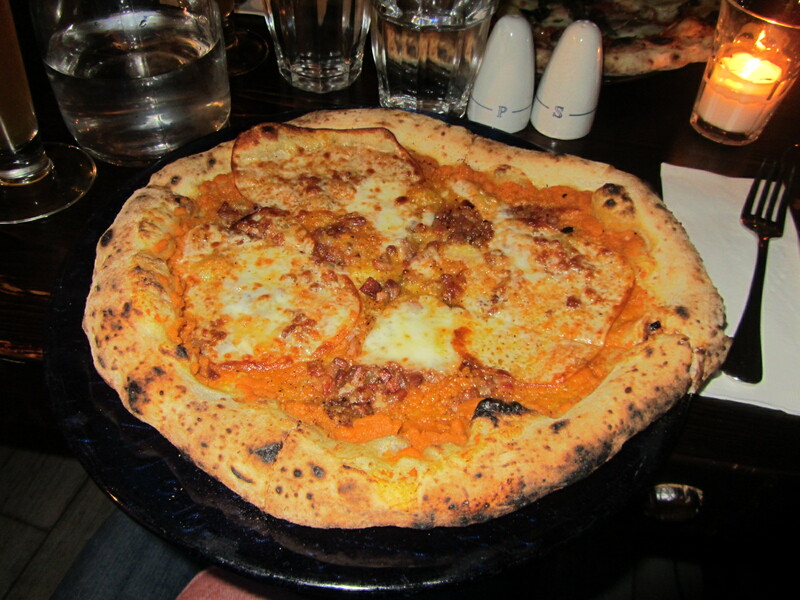 I wasn’t sure what to make of pumpkin on a pizza, but the Autunno pizza, with it’s pumpkin puree base (instead of tomato sauce), smoked mozzarella and pancetta, inspired all sorts of confidence. And good God! It was delicious! The pumpkin puree had just enough subtle sweetness to play the perfect complement to the flavorful, salty pancetta sprinkled throughout. To round everything out was the smoked mozzarella which was just the right amount of smokey instead of the usual creamy, milkiness to make for a really delicious pizza. As the great pumpkin binge of 2012 continues, I’m glad to know I have Forcella’s delicious autunno pizza to turn to when I need a break from the sweet stuff. This entry was posted in Dinner and tagged Forcella, Neapolitan pizza, pancetta, pizza, pumpkin, pumpkin puree, smoked mozzarella. Bookmark the permalink.